DIY Mobile Home Repair for Electrical, Plumbing, Roof, Wall, Floor. Click Keywords Above to find the information you need. Get the Mobile Home Parts you need NOW! Electric furnaces are the most common heaters used in mobile homes especially in the southern US and other temperate climates around the world. Gas furnace units will be covered on a different web page. I suggest checking out the furnace well in advance of cold weather. The furnace is the number 1 mobile home repair required during the winter.The most common brands used in manufactured mobile homes are Intertherm, Coleman, Nordyne and Revolv. Understanding how they work is not really difficult. The information provided is to help you understand how an electric furnace works. I strongly recommend that if you are having problems that you seek a qualified and licensed technician to repair your heater furnace. You can look at the ductwork page to see how it all ties together. increments. Changing these setting can affect the operation and efficiency of the electric furnace heating system. The thermostat gets it's power from a transformer that is mounted in the heater which gets it power from the circuit breaker in the unit to provide low voltage, usually 24 volts, to operate the thermostat. Once the sequence has started a relay is engaged that passes power through a series of sequencer relay switches to turn on the different segments of the heating coils in stages. This prevents the heater from placing a sudden large load demand on your homes electric service. The heating strips are usually divided into 5000 watt sections so that only 5000 watts at a time come on until all the elements are up to full temperature at which time the blower motor comes on with the aid of a capacitor to distribute the warm air throughout the house via the duct work. As a fail safe the heater has a limit switch that will shut off the heater coils if the temperature is excessive to prevent fire danger. There is very little difference in the operation of furnaces by brand name. Component layout and wiring color codes may vary by brand. 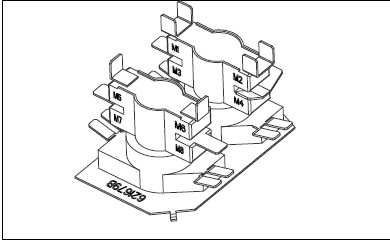 Below is a picture of the components of an electric furnace. This unit is a Nordyne. 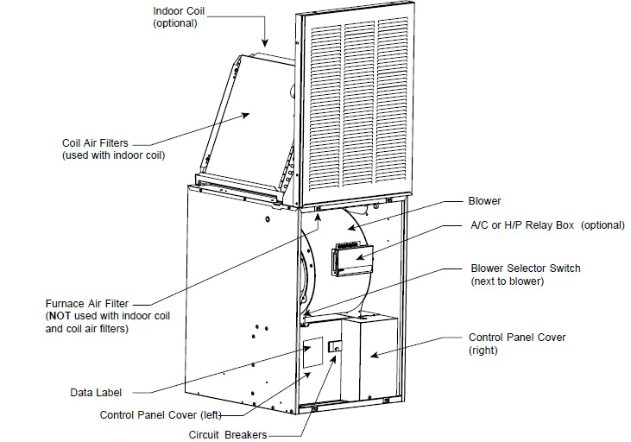 Note that this component layout diagram picture shows an air conditioning evaporating unit that is not discussed on this web page. The main components of the electric furnace system are the thermostat, transformer, heating coils, sequencer relay switches, limit switch, motor start capacitor and blower fan motor. If you have an electronic type of thermostat with a digital display and you notice that there is no display this could mean that 1. the thermostat is defective 2. the the transformer is bad or 3.the circuit breaker has tripped. If you have heat and it seems to only be blowing slightly warm air one of the sequencer switches may be bad and is not allowing all the elements to come on or a coil is defective. Sometimes this problem will also cause the heater to kick on and off more often in an attempt to maintain the homes temperature as set on by the thermostat. The heating unit kicking on and off excessively will make your power bill go up. If the sequencer relay is bad you will have no heat at all. 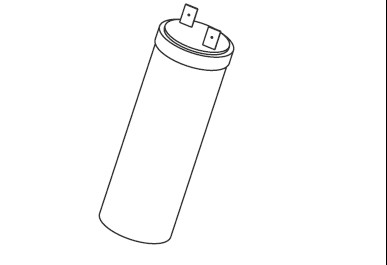 If the blower fan motor or capacitor is defective the strips may come on but the fan will not come on and the limit switch will then turn the elements off for safety. 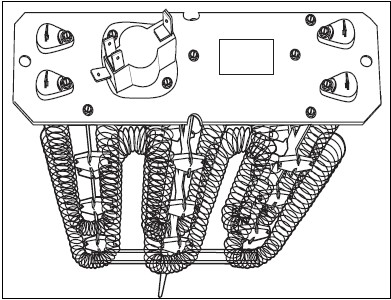 The heater strips may break after a period of time, in which case you would have no heat or reduced heat, and can be replaced as single component. Any components that are changed need to be an exact match by part number of the defective device you are replacing. Not doing so can cause further problems and create dangerous hazards. 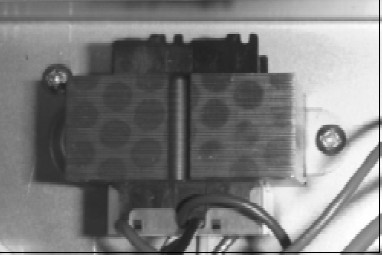 Below is some pictures of the the heater components I spoke about. Hover your mouse over each picture for description. The number one service thing to do is to always keep the filter changed to allow good air flow for maximum operating efficiency. Some fan motors have oil ports on them that need to have a drop or two of oil injected into the bearings, though now a lot of fan motors have sealed permanent lubricated bearings. Build up on the fan blades is a problem that I have seen in many cases. 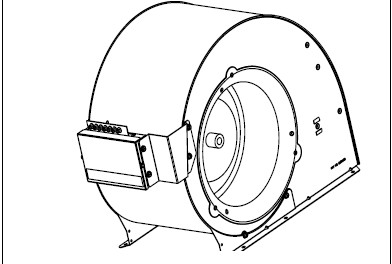 This cuts down on the fans ability to move the maximum amount of air through the duct system. You can clean this off by scrubbing squirrel fan blades with an old toothbrush and vacuuming the fan blades, which can be tricky to do because of the tight clearance spaces involved. If you choose to do any work inside the unit ALWAYS turn off the power at the homes main circuit breaker panel and inside the unit itself. Once again I recommend that repair service and parts replacement be done by a professional. Most electric heaters are generally on a 60 amp double pole breaker. If they have the air conditioning option that will mean that they also usually have a 30 amp double pole breaker that needs to be turned off before doing any tasting or inspection inside the unit, turn the breakers off at the unit and inside the homes breaker panel to avoid electric shock.